Stratford-upon-Avon College has helped Warwickshire’s school and college leavers on the first step towards a successful career. On Friday 18 September, the College held its Get the Edge Apprenticeship Careers Fair. Students and young people from across Warwickshire attended the event and talked to employers about their apprenticeship opportunities. Among the employers in attendance were Jaguar Land Rover, RAF and Q Hotels. The College’s Work-Based Learning team were on hand to discuss the content and mutual benefits of apprenticeship programmes, and young people currently taking part in the scheme gave talks on life as an apprentice and the advantages of combining practical training with college-based tuition. The fair also saw the launch of the College’s Apprenticeship Academy, which will provide assistance to the county’s students who are interested in apprenticeships with local firms as a launch pad for a future career, by offering weekly coaching sessions on vital skills such as CV writing and effective interview practice. The College is confident that this new initiative will provide the students with the best chance of securing the right apprenticeship and so set them on the path to career success. 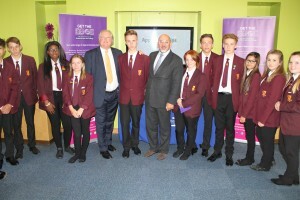 Stratford MP Nadhim Zahawi and business entrepreneur Lord Digby Jones both attended the event and gave inspirational speeches to open the Fair and officially launch the Academy. They stressed the benefits of apprenticeships for both students and employers: apprenticeships offer fantastic opportunities for preparing students for the world of employment, and employees gain an enthusiastic addition to their workforce, whilst at the same time paying back into the community. They also acknowledged the great commitment Stratford-upon-Avon College has shown to apprenticeships by hosting such a valuable event and launching its Apprenticeship Academy. Nicola Mannock, Stratford-upon-Avon College Principal and CEO, explained the College’s view of apprenticeships: “We are extremely proud of our apprenticeship programmes. Our aim is to set our students on the road to a successful career, and our tailor-made combination of College-based learning and work-based training, enhanced by the assistance provided by our new Apprenticeship Academy, provides the best opportunity for achieving this. This year, we are running 25% more apprenticeships for 16 – 18 year olds; we really are going from strength to strength. For more information on any of Stratford-upon-Avon College’s courses, please visit www.stratford.ac.uk or call the College on 01789 266245.